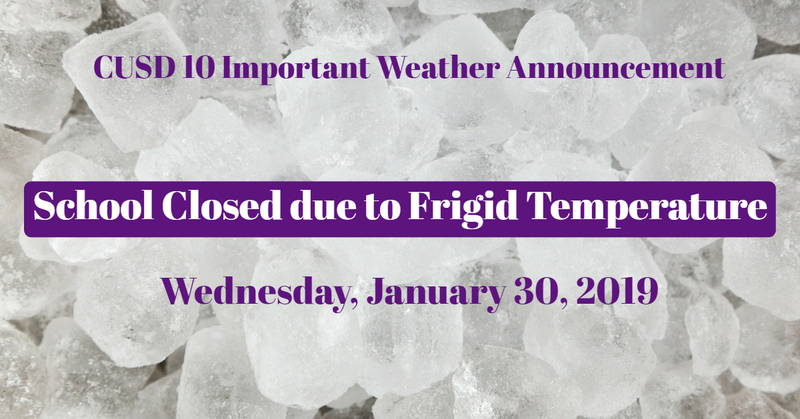 Due to the forecast of dangerously cold temperatures on WEDNESDAY, January 30, 2019, CUSD 10 schools will be closed. District administrative offices will be open. School-related activities are canceled. CHS Varsity Girls Basketball, Boys Basketball, Wrestling and Cheerleading will hold practices. Scheduled high school athletic competitions are still pending. Please check information posted by Kahok Athletics​ on their website or social media. Players should contact coaches for more details.